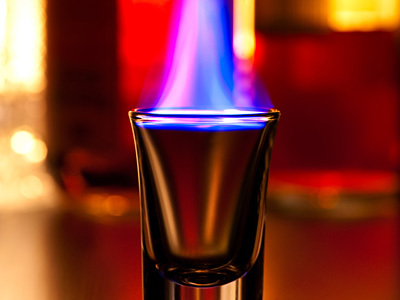 Flaming drinks are always fun and bring some excitement to party. This flaming dr. pepper shot recipe uses the traditional ingredients and doesn’t tinker around to get the perfect taste as of Dr Pepper. However, it describes two different ways to build and enjoy it. Read on to find out how. There are two ways in which this shot is enjoyed. First Method (recommended): Pour amaretto and then rum in the shot glass. Place shot glass in the larger beer glass and pour beer around it till brim of the shot glass. Set amaretto/rum on the fire and let it burn for few seconds. Blow out the flames and drink as fast as you can. Second Method: Pour beer in the beer glass until half full. Pour amaretto in the shot glass and gently top it with rum such that it floats on the top. Light the rum and set it on fire, let it burn for few seconds and drop the shot glass in the beer and chug (make sure to blow out the flames before shooting if they are still burning after dropping the shot glass). Always have fire extinguisher handy when building flaming drinks. Make sure not to crack your teeth with shot glass while chugging.